Your CMS Brembana spindle is in expert hands with the factory-trained, Big Plus–certified technicians at High Speed Technologies, Inc. We have repaired dozens of CMS Brembana spindles to original factory performance. Need it fast? We can repair and rebuild your spindle within three days of customer approval, and we offer reduced pricing for longer lead times. All spindle repairs are backed by a complete warranty and our 30-year reputation of OEM-quality spindle repair. 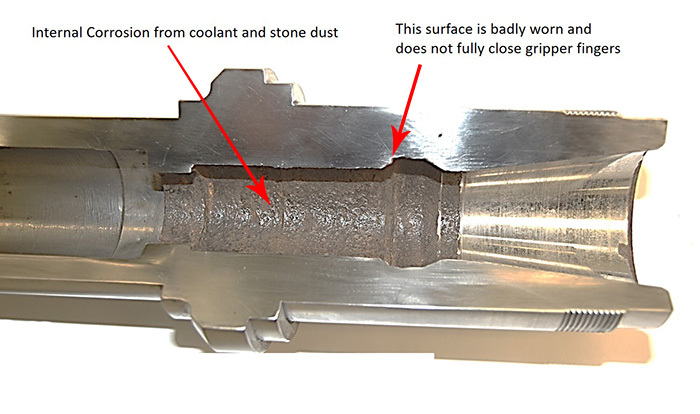 Excessive corrosion on the shaft interior is a common problem with CMS Brembana stone cutting spindles. 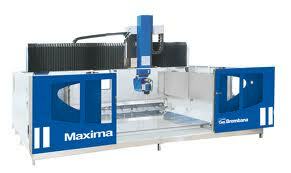 CMS Brembana make excellent machines and spindles. But as we’ve noted several times, stone cutting spindles live a very hard life. They must function with high precision all the while operating in an environment where they are deluged with tool coolant and abrasive stone slurry. The stone slurry works its way into the cavity where the gripper assembly grabs the tool holder retention knob. This slurry wears down the edge that contacts the gripper fingers and results in poor tool retention. This damage can become manifest by poor part finish as the tool will wobble around inside the shaft. It may even allow tools to be thrown out of the spindle; especially larger diameter tools. Unfortunately, we cannot repair this damage. So, the only option is to purchase a new shaft from CMS. This significantly increases the cost of a standard repair. Some CMS machines have a rinse off or air blast to clean stone slurry from the face of the tool holder. If you machine is equipped with this feature make sure it stays in good operating condition. No matter what, check your tool holders and keep them free from debris build-up that can damage the shaft. These surfaces become worn from stone dust slurry. Once they are worn too far the tool is not properly held in place. We cannot repair this surface. 1) Actuator Pushes Drawbar forward and the gripper fingers open.